Definition at line 23 of file Segment.h. Definition at line 305 of file Segment.cc. Definition at line 310 of file Segment.cc. References debugs, doUnlink, HERE(), NULL, Segments, theMem, and theName. Definition at line 362 of file Segment.cc. References debugs, Enabled(), fatalf(), and HERE(). Referenced by create(), and open(). Definition at line 327 of file Segment.cc. References assert, checkSupport(), debugs, doUnlink, fatalf(), HERE(), Segments, String::termedBuf(), theMem, theName, and theSize. Referenced by Name(), and Ipc::Mem::RegisteredRunner::useConfig(). Definition at line 321 of file Segment.cc. Referenced by checkSupport(), MemStoreRr::finalizeConfig(), and Name(). Definition at line 39 of file Segment.h. Referenced by Ipc::Mem::Object< Class >::Object(). Definition at line 37 of file Segment.h. Definition at line 52 of file Segment.cc. References String::append(), SBuf::append(), assert, BasePath, SBuf::c_str(), Config, YesNoNone::configured(), create(), DBG_IMPORTANT, debugs, doUnlink, Enabled(), fatalf(), HERE(), Must, name(), NULL, open(), p, PRId64, Segment(), service_name, shm_open(), shm_portable_segment_name_is_path(), shm_unlink(), SquidConfig::shmLocking, String::size(), String::termedBuf(), theMem, theName, theReserved, theSize, xstrerr(), and ~Segment(). Referenced by Rock::SwapDir::inodeMapPath(), StoreMapAnchorsId(), StoreMapFileNosId(), and StoreMapSlicesId(). Definition at line 345 of file Segment.cc. References assert, checkSupport(), debugs, fatalf(), HERE(), i, Segments, String::termedBuf(), theMem, theName, and theSize. 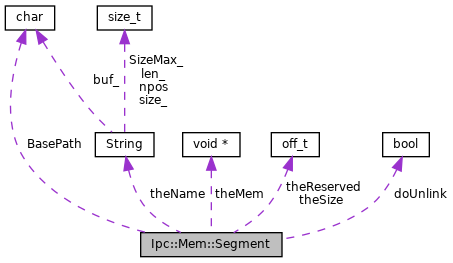 Referenced by Name(), Ipc::Mem::Object< Class >::Object(), and Ipc::Mem::RegisteredRunner::useConfig(). Definition at line 38 of file Segment.cc. References assert, Must, theMem, theReserved, and theSize. Referenced by mem(), and Ipc::Mem::Owner< Ipc::MultiQueue::Metadata >::New(). Definition at line 38 of file Segment.h. Definition at line 43 of file Segment.h. Referenced by Name(), and testRock::setUp(). Definition at line 77 of file Segment.h. Referenced by create(), Name(), and ~Segment(). Definition at line 74 of file Segment.h. Referenced by create(), Name(), open(), reserve(), and ~Segment(). Definition at line 73 of file Segment.h. Referenced by create(), name(), Name(), open(), and ~Segment(). Definition at line 76 of file Segment.h. Referenced by Name(), and reserve(). Definition at line 75 of file Segment.h. Referenced by create(), Name(), open(), reserve(), and size().